Heavy rain over the weekend has taken its toll on the Heaphy Track. The swing bridge across the Lewis River was destroyed during serious flooding that occurred in the region. “We believe that the unusually high floodwaters eroded the true right river bank, undermining the tower and anchor block and causing the bridge to collapse,” said Department of Conservation Programme Manager for Visitor Assets, Jonathan Thomas. 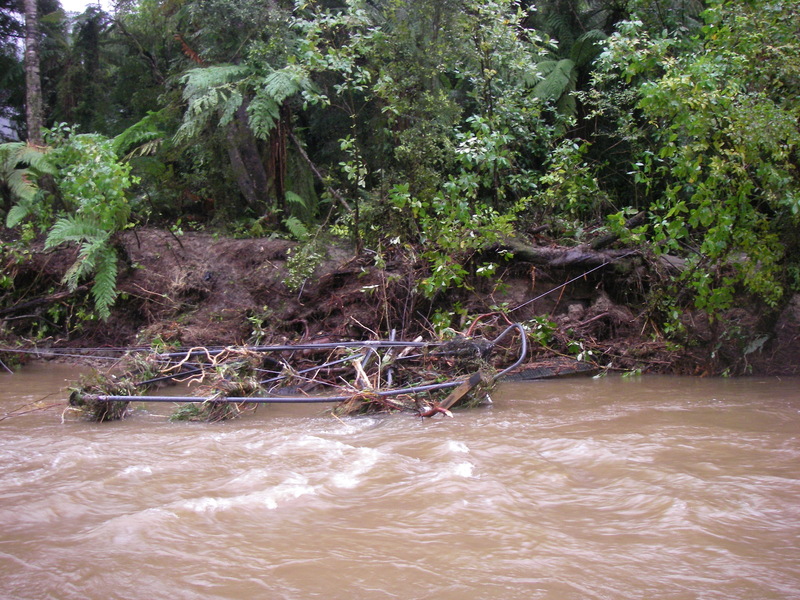 The Heaphy River is able to be forded immediately south of the Lewis Hut during normal river levels and DOC staff have erected signs and markers indicating the safe crossing. Hut Warden Lizzie Coates, who is based on the track over the winter season, discovered the destruction, but was able to safely cross the river by midday on Monday. As a result the Department will not be closing the track, however, trampers and mountain bikers who are planning to use the Heaphy Track are advised to check the weather forecast carefully and to be aware that travel times may be longer than indicated. The two bridges that span the rivers at the Lewis – Heaphy confluence were due to be replaced later this year by a single 100-metre span suspension bridge. The Department of Conservation will now look at bringing this work forward. Floodwaters have also caused moderate damage to some other sections of the track along the river banks, as well as causing some erosion along the coastal sections of the track. Department of Conservation staff are working this week to begin rerouting the track around problem areas and repairing track damage. Users are asked to bear with us while this is happens, and to be aware that it may take six months for the bridge to be replaced.